Here’s a last minute brussels sprouts recipe that may be just the perfect new side dish to add in to your traditional Thanksgiving spread. I tried it out last week and it’s the kind of veggie dish that is melt-in-your mouth delicious. So, without further ado, here’s how it goes (and why it’s so good for you). After prepared and tossed with olive oil, sea salt, and freshly ground pepper, the brussels sprouts are roasted at a high heat. This brings out their natural sugars and caramelizes the outermost leafs. 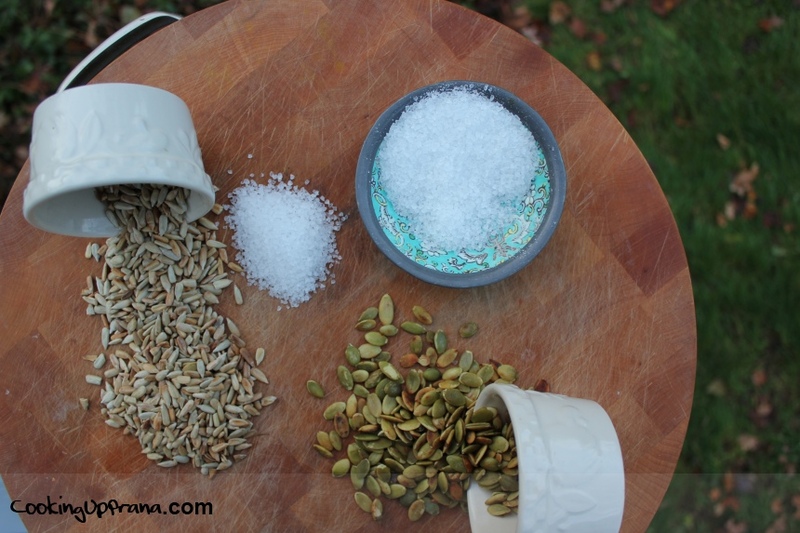 To finish it off toss with toasted sunflower seeds and pepitas and the sweet touch of maple syrup. Brussels sprouts are an important dietary source of many vitamin antioxidants, including vitamins C, E, and A (in the form of beta-carotene). These healthy sprouts are also a good source of anti-inflammatory providing omega-3 fatty acids. 100 calories of brussels sprouts provides 30% of the recommended daily intake of omega 3 fatty acids. That’s a powerful medicine in one tiny veggy! 2. 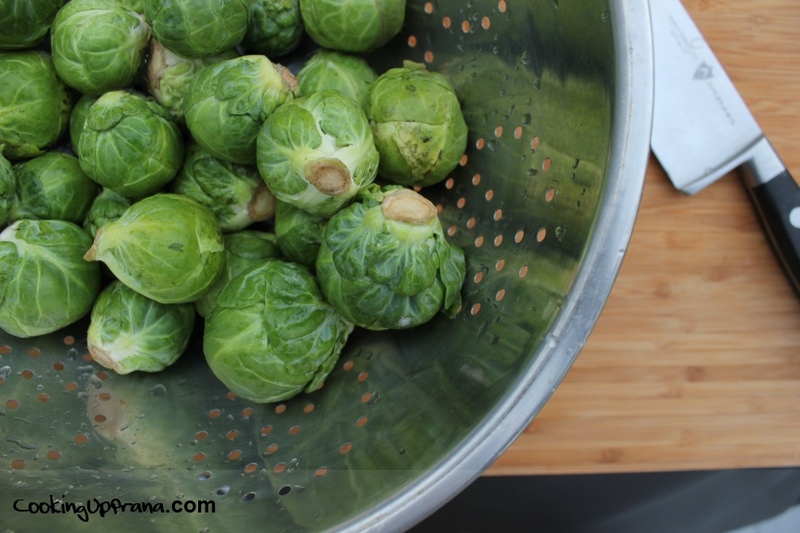 To prepare the brussels sprouts, rinse well and remove any brown or discolored outer leaves. Cut off the stems and slice in half. 3. 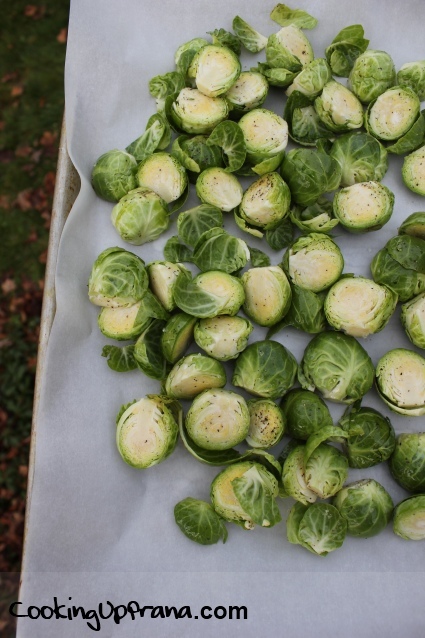 In a large bowl, toss the brussels sprouts with the olive oil, sea salt and freshly ground pepper. 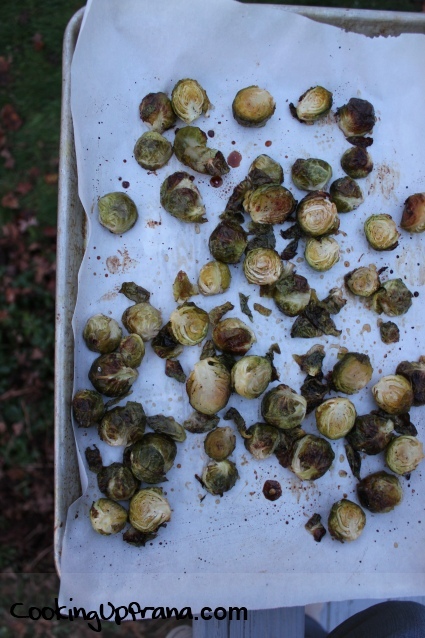 Once evenly coated spread the brussels sprouts into a 9-by-13-inch baking sheet lined with parchment paper to roast. Note: Due to the caramelizing process the parchment paper is really helpful. 4. After 15 minutes, give the brussels sprouts a quick stir with a spatula to even out the browning. After 30 minutes, drizzle the sprouts with the maple syrup and stir well to coat. 5. Continue to roast the brussels sprouts for another 15 more minutes, or until they are fork tender (about 45 minutes total roasting time). 6. 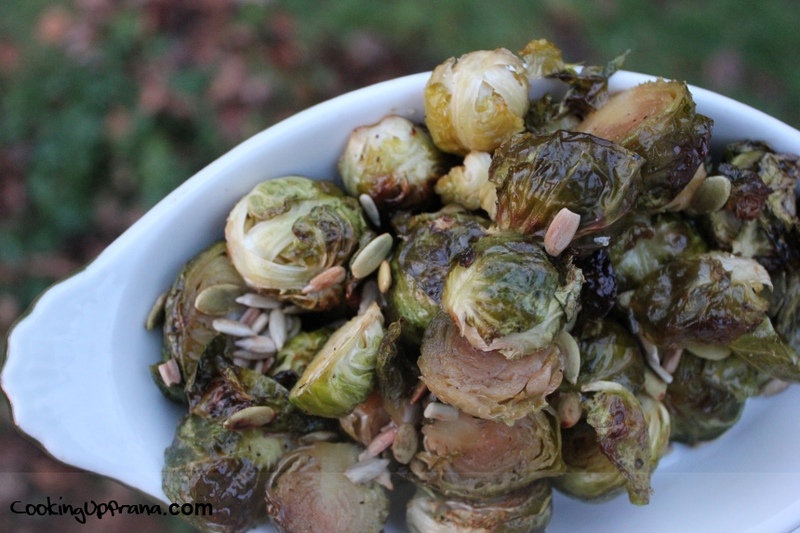 Toss the roasted brussels sprouts with the sunflower seeds and pepitas and enjoy!